Washington, DC – The US House of Representatives on Thursday approved a bill to end US support for the Saudi-UAE war in Yemen, sending US President Donald Trump another rebuke over his support for the Kingdom of Saudi Arabia. The measure, passed in a 247-175 vote, now goes to Trump, but the White House has signalled that the president is likely to veto the bill. Passage of the resolution, approved previously by the US Senate, marks the first time the United States Congress has acted under the War Powers Act of 1973, a Vietnam War-era law introduced to curtail a US president’s deployment of US military forces without congressional approval. Since 2015, the US has provided aerial refuelling of jets, reconnaissance, targeting and intelligence information to Saudi Arabia and the United Arab Emirates (UAE), in their campaign against the Houthi rebels who unseated the Saudi-backed government in Yemen. 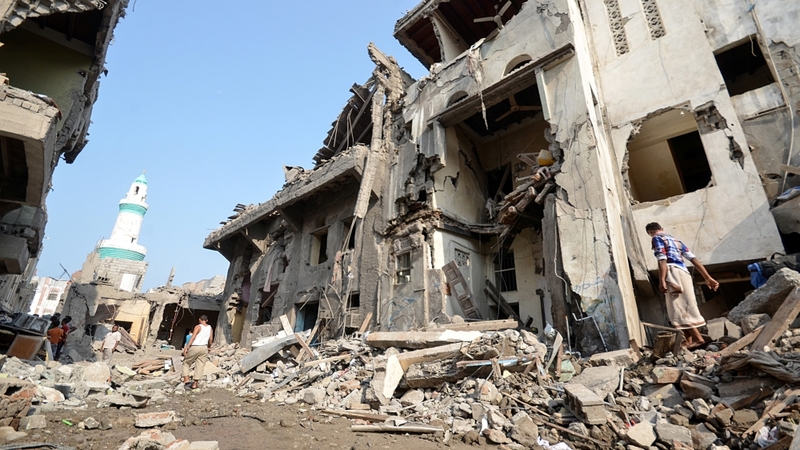 Saudi Arabia and a coalition of Arab governments have launched more than 19,000 air raids across Yemen. The Saudi-UAE military authorities are recruiting Yemeni children, many of them desperately poor, to fight along the Saudi border against the Houthis, Al Jazeera previously reported. Two-thirds of the child soldiers in Yemen fight for the Houthis, according to a United Nations report. “I became convinced long ago that we cannot tie ourselves to the Saudis and the Emiratis given the way in which they have conducted this war,” Democratic Senator Chris Murphy told Al Jazeera. “If they are recruiting child soldiers, it just adds to the list of reasons why we need to be out of this coalition as soon as possible,” he added. “We have plenty of other avenues we can pursue. We can continue to push sanctions legislation in the committee. We can look at future arms sales votes. There is only so much we can do if the president refuses to change direction,” Murphy said. The Trump administration argues that by directing the military to support a US ally, the president is acting within his constitutional authority. The president’s “senior advisers would recommend he veto the joint resolution,” the White House Office of Management and Budget said in a statement of administration policy. Many US politicians are unhappy with the Trump administration’s handling of the US relationship with Saudi Arabia following the October 2018 murder of Saudi journalist Jamal Khashoggi at a Saudi consulate in Turkey. US intelligence agencies have reportedly concluded that Saudi Crown Prince Mohammed bin Salman (MBS) was involved in Khashoggi’s killing, a conclusion the kingdom denies. A bipartisan group of senators led by Senator Bob Menendez have introduced a separate bill that would impose sanctions on members of the Saudi royal family and others for the killing of Khashoggi. Republican Senators Lindsey Graham, Susan Collins and Todd Young are cosponsors. Trump has declined to answer demands from Congress that the US reach a determination on MBS’s role and impose sanctions under US human rights law, the Global Magnitsky Act. Khashoggi’s family have received homes and cash payments from the Saudi government since the killing, according to a Washington Post report. The Democrat-controlled House had previously approved Thursday’s measure on a 248-177 vote on February 13, but was required to redo the vote to overcome a parliamentary hurdle raised by Republicans. The resolution excludes US drone attacks and special forces operations against al-Qaeda in Yemen from the terms of its prohibition. US forces conducted six air attacks in March against what the US military says were al-Qaeda targets located in the Al Bayda Governorate in Yemen, according to an April 1 statement by the US Central Command. A previous US drone attack in Yemen on January 1 targeted and killed Jamal al-Badawi, who the US says was one of the planners the 2000 al-Qaeda bombing of the USS Cole naval ship in Aden Harbour that killed 17 American sailors.